Le Tigre Hotel is located in the heart of Siem Reap on Sok San Road, a lively area with plentiful restaurants and small shops. By tuk tuk it is a three-minute ride to the Old Market, Pub Street and the Night Market, and Angkor Wat is about 20 minutes away. 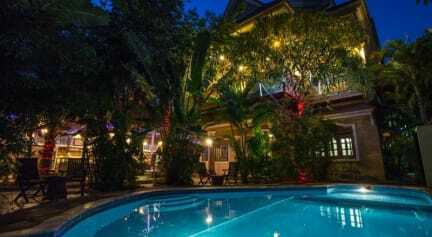 Le Tigre Hotel is a beautiful colonial-style villa in the heart of Siem Reap city. The verdant tropical garden offers you a tranquil place to unwind or take a refreshing dip in the pool. Inside, you will find a gorgeous blend of traditional woodwork and clean modern design. Le Tigre Hotel’s restaurant and bar is nestled in a peaceful tropical garden and offers a range of options for breakfast, lunch and dinner. Enjoy a hearty meal, light snack or simply relax with a drink by the pool or in the shaded dining area. 1. Check in from 1pm and check out until 11am. Rundum gut. Alles sauber, sehr freundliches hilfsbereites Personal. Personal hat die Tour dann auch nach battambang gebucht, den Tuk Tuk Fahrer für Angkor Wat gebucht. Sogar einen Roller konnten wir über die Rezepte buchen. Wenn nochmal Siem Reap dann dieses Hotel.